Location: Main Index » Forum Index » Chevrolet Cars 1958-1970 » 1965-1966 Fullsize Chevys » She finally moves!! Except for a quick trip around the block in 2016 to find out the motor was bad, Its been about 28 years since I have driven this car. I am happy to say she is alive and well. The 396 (405) broke in fine. Since the break-in went so well I have started hanging all new front suspension parts to be able to cruise this summer! Drop spindle disc brake kit arrived as well as the new steering linkage kit from PST, new shocks, 1 1/8 sway bar and tubular upper and lower control arms. Hey, that's good looking car. That 1&1/8th bar is going to be the single best handling improvement you can make on these cars. The car looks great, but those rotors and calipers are small for that car and I'd hate to see them get you into trouble. They're the size from the GM 80's mid-size G-bodies (Monte Carlo etc) and weren't known for being very good on that chassis. I would recommend you get a set of heavy duty semi-metallic pads to give the brakes as much bite as possible and less fade. I have 12" x 1.25" thick rotors with bigger calipers and I wouldn't want the brakes on my car to be any smaller. I've been contemplating fitting a set of C5 Vette brakes to the car, with 13" x 1.25" rotors. One bad emergency stop will convince you better brakes are needed. Corvette parts are readily available also. If those are the offshore front arms I HIGHLY recommend turfing the ball joints they come with and get MOOG Upper and Lower replacements. nice looking 65 vert ! ive enjoyed mine for some years now. i hate to add to your parts watch list but im speaking from been there done that.... that particular idler arm when installed seems to wear quickly, ive been through two of those in five cruising seasons til i finally located a good moog idler arm,so far so good. no fault of the seller, as im sure these are mass produced overseas but,surely keep an eye on it..
Driver side is done, fighting pass side lower control arm bolt for 2 days now. Gonna have to cut it out. BTW who knew that bolt was $114!! Just my opinion, but I'd hate to see you get frightened into paying big $$$ to put Corvette brakes on your Impala. I put G-body disc brakes on my 69 Chevelle with a big block, and it stopped great. 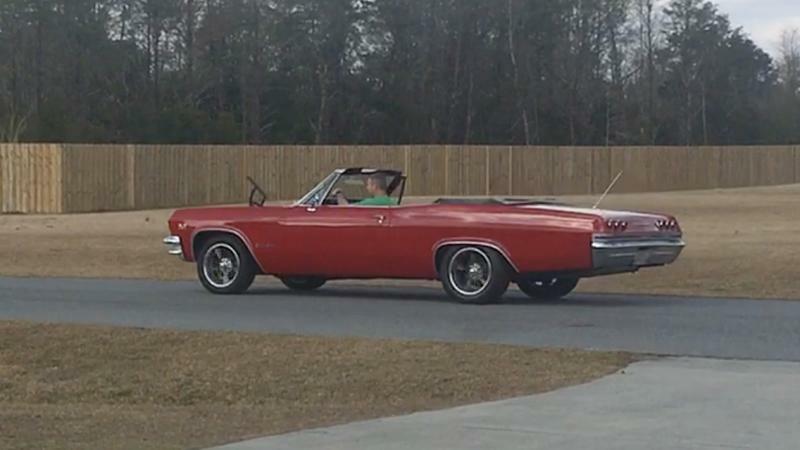 My 65 Impala only weighs about 150- 200lbs more than my Chevelle. And the G-body discs are DEFINITELY an upgrade over the stock drums, which by the way work well enough to where I'm perfectly happy driving my Impala with the drum brakes. Everything is on! It seems to stop great so far. Handling is WAYYY better. I got to get it to the alignment shop and start putting some miles on it! Looks great! Love those wheels. Whereabouts in Georgia are you? I'd love to see your car if you're ever in my neck of the woods (Marietta). Where did you purchase the control arm bolt? I will be rebuilding my front end on my 65 SS and would like to have some insurance if I run into the same issue. A company called Rare Parts is the only place I found the bolt/bushing. They wanted $114, so I took the part number to EBAY and ended up getting it for $84. Still an expensive bolt, but you need it. Execution time: 0.083 seconds. Total Queries: 22 Zlib Compression is on.